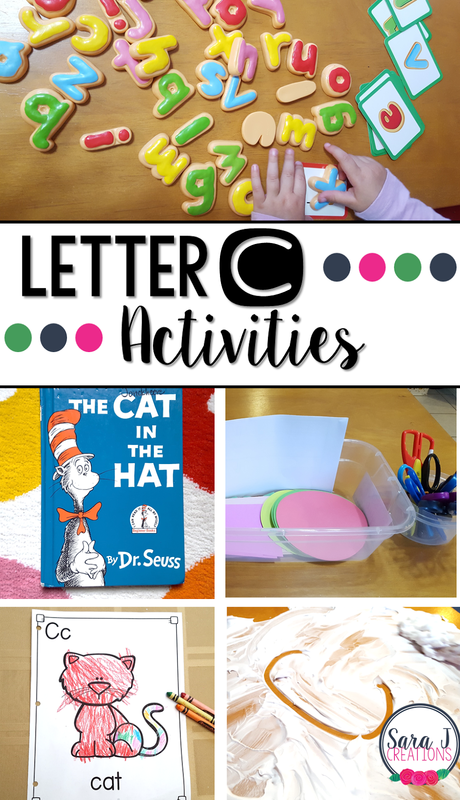 Preview: Letter C Activities that would be perfect for preschool or kindergarten. Sensory, art, fine motor, literacy and alphabet practice all rolled into Letter C fun. Up next in our weekly alphabet study is the letter C activities. This week was full of activities that started with the letter C like cookies, cutting and cream (shaving). We also spent some time reviewing other letters we've learned and building our sensory and fine motor skills. Join us each week for some alphabet activity fun! To start our study of the letter C and a week of fun activities, we read the book The Cat in the Hat by Dr. Seuss. We talked about how the word cat starts with C. Then I showed my daughter what a C looked like in the book and we searched for other C's. I made sure to pick a book that matched the picture that we would create next for our alphabet art book. For the alphabet book we are working on, we added C is for cat. We decided to create a colorful cat with crayons. How's that for the letter C? I love that this is a skill she can work on independently while I prep for other activities. To practice writing the letter C, I put our alphabet tracing sheets in a reusable plastic sleeve and gave her a dry erase marker. Because she is still young and I'm not expecting perfection, we didn't spend a ton of time on correct form. I showed her how to form the letter, let her trace it a few times and then try writing it on her own. Then we did the same thing for the lowercase c. She is getting better each week with more control as she forms the letters. We also practiced finding the letter C on our bingo markers sheet that is part of our Alphabet Centers with Real Pictures set. We grabbed some bingo dabbers (dot markers) and I let her dot the letter every time she found an upper or lowercase C.
For some fine motor practice, we set up a mini cutting box, because C is for Cutting. We set up a larger Fine Motor Cutting Box last year and my girls LOVED it. They spent so much time cutting all of the different materials. For this week, I just made a smaller version. I grabbed different types of scissors, different papers (notepads, scrap paper, index cards, etc.) and an empty bin to cut the scraps into. M worked on cutting out whatever she wanted and practiced opening and closing the scissors by herself. For our sensory play this week we used shaving cream. This is a great way to get your tables/desks clean! Just squirt some shaving cream onto the table and let students touch and explore. Then once the surface is covered, practice writing letters with one finger in the shaving cream. Just a suggestion - get a good smelling shaving cream. Ours is just a cheap version but it left a stinky man smell in our kitchen all day. But the girls had fun, the shaving cream easily washed off of them and the table got wiped down. Since we are only spending one week on each letter, I wanted to make sure to build in some review each week of the other letters we've covered so far. First up we worked on matching upper and lowercase letters using the puzzles from my Alphabet Centers with Real Pictures. She did a good job when the letters looked the same, but struggled with letters we haven't studied yet if the upper and lowercase looked different. Next up, we used our alphabet cookie set because C is for Cookie! I love this ABC Cookies Games, because both of my girls can use them in different ways. This set comes with cards to support different levels of learners. There are basic just match the letter cards like my youngest is using above. There are also cards for what letter is missing, sequencing letters, beginning sounds, and missing letter with beginning sounds. My oldest is to the point where she could work on identifying the initial consonant for some of these basic CVC words. They both had so much fun and the possibilities are endless with these cute cookies. Another game that the girls could play together was the Spin and Cover games from my Alphabet Centers with Real Pictures set. They took turns spinning the paperclip around the pencil and then finding and covering the letter that they landed on. The last person to cover a letter on the board is the winner. This was perfect for reviewing the letters we've learned and previewing some upcoming letters.